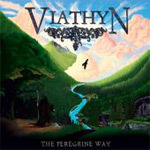 Hailing from Canada, Viathyn premiers with The Peregrine Way, an exceptional work of melodic progressive power metal. This four piece packs a lot of music into every song. The general description is somewhere between majestic and epic as Viathyn blends clean vocals, a blistering rhythm section and Jacob Wright's ambitious fret work over lively, melodic, and often symphonic layers. Sirenum Scopuli, The Oracle's Prophecy, and the speedy Blackened Woods prove Viathyn's power and depth. But it's not all galloping power metal, Viathyn engages in some folk metal with the acoustic driven Canvas. Ultimately, however, the major emphasis seems to be upon Wright's performance, nearly to the exclusion of the others. If you love proficient and copious amounts of neo-classical fret work, then The Peregrine Way will more than satisfy your appetite. Yet too much of a good thing isn't always the best thing. Between the characteristic power metal and the abundance of guitar solos, this disc could be considered predictable. Nevertheless, The Peregrine Way is a strong debut, a fine work of melodic progressive power metal from a band that gets right. Recommended. The Peregrine Way is a strong debut, a fine work of melodic progressive power metal from a band that gets right.